Many conservatives will be holding their nose to vote for Romney because Obama MUST go, but I don't know of ANY conservative or Republican who is going to support (or campaign for) Obama. There are people out there like that though (some if it has to do with race-based voting), and they are pretty much NUTS! 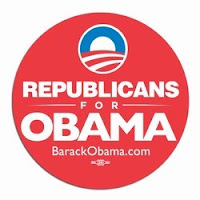 I mean seriously, it takes a nut job to say they are Republican and be for Obama at the same time. When I heard about "Republicans for Obama", I was not surprised to find that the president of the organization (and probably the sole member of this group) was someone I've exposed recently. Bishop L. J. Guillory, the President of Republicans for Obama is (in my opinion based on facts) a Racist Convict trying to con people into believing his delusions. He likely uses money donated to his "non-profits" to pay for his many lavish trips to Hollywood. He has an infatuation with the Masons and he believes that Mitt Romney is part if a plot by the illuminate. I first heard of Bishop L. J. Guillory when he came to Jasper, TX last year to defend council members who were getting recalled. The council members were getting recalled for hiring Rodney Pearson as the new police chief even though Pearson was at the bottom of the candidate qualification list, and Pearson even lied about having a criminal record. Guillory of course claimed the recall was a result of racism, even though I interviewed black residents in Jasper who were in favor of the recall due to the fact that Pearson was not qualified and was hired in a backroom deal. Guillory is the self titled "Ombudsman General." According to officials in Jasper, Guillory was wearing a badge and posed as a Department of Justice Official. After some investigating, I found out that Guillory spent 7 years and 7 months of a 15 year sentence in prison in California. His past criminal history includes charges of kidnapping, burglary, robbery, and even trying to prevent/dissuade a witness to testify. Guillory has told me that he is innocent and was actually granted clemency but he rejected it. This turned out to be false because, in reality, court records show that Guillory unsuccessfully tried to get out of prison by appealing his case. The court rejected Guillory's appeals and said that Guillory was rightfully convicted by a jury. Guillory claims to be a Republican, but he has publicly praised Obama and has posted up on his blog personal pictures of him with radical liberal Democrats like Al Sharpton and Jesse Jackson. Guillory spends his time running an organization (Ombudsman International aka Save America Foundation) that he claims is meant to help people, but I do not know of anything that his organization has accomplished. Guillory shows up to situations where black and whites are involved and he pulls the race card and acts like some kind of government official who is there to fix things. in one situation, a black student stabbed and killed his white teacher. Guillory showed up defending the murderer and of course pulled the race card. Guillory was kicked out of the courtroom and was banned from the premises. In the video I posted above, Guillory even claimed to have lowered crime in the the top ten cities most crime filled cities in America! Guillory spent time in prison and (I think) he used that time to think about how he can con people by claiming to help people. I believe his purpose is to use the guise of helping people as a way to get himself on the news and to get money to fund his lavish lifestyle. He uses his causes as a way to meet and to mingle with Hollywood celebrities. I do not know of any job he has, besides traveling the country stirring up trouble and mingling with celebrities as the Ombudsman General. With no financial source, I wonder if he is using donations to his "organization" as his personal financial source. He seems to be the only member of his organizations and it is registered as a non-profit, so he really has no oversight and pays no taxes. I also believe that he also gets money from suing people. Everyone who speaks out against Guillory (including myself) has received the threat of Legal Action by Guillory unless we apologize and remove bad (factual) info about Guillory from online. When I first exposed Guillory, I was threatened as well, but I did not back down from posting the truth about Guillory. In response, Guillory posted on his blog that I am a racist, part of the KKK and went on to attack my bother by calling her names. He did not respond to the facts I presented and only responded by making a baseless accusation or racism and calling me names. This man is a fraud and a complete nutjob. Yep, he fits right in with Al Sharpton and Jesse Jackson. Republicans for Obama? What a joke!